Water resistant and shockproof charging stations with socket outlet or attached cable. Depending on your electric vehicle and your EVlink Wallbox charging power, you can charge up to ten times faster than a domestic socket-outlet. *Based on 22 kW Wallbox version. With a 7.4 kW rating, you can charge up to 3 times faster. 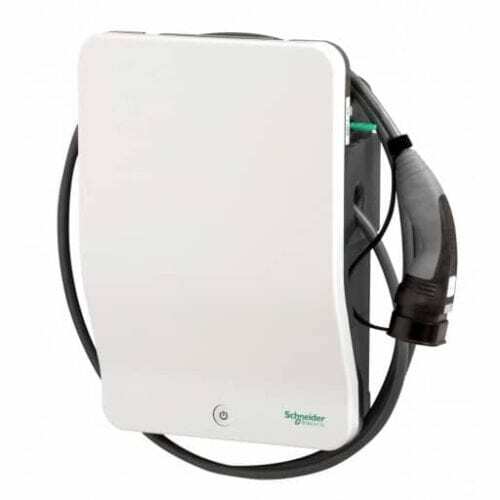 Based on a strong expertise in operating charging stations and a worldwide presence, Schneider Electric helps you find certified contractors for quotation, installation and commissioning. We also provide warranty extension on demand. Serving customers in over 100 countries, Schneider Electric is a French multinational corporation, the global specialist in energy management and automation, helping manage customer’s energy and process in ways that are safe, reliable, efficient and sustainable. From the simplest of switches to complex operational systems, their technology, software and services improve the way customers manage and automate their operations. With over 180 years of history and innovation, Schneider Electric’s connected technologies will reshape industries, transform cities and enrich lives. At Schneider Electric, they call this Life Is On. Join our ZEROhomebills Community. The BEST Products from the BEST Brands at the BEST Prices. Further discounts on bulk purchase. Buy now your Schneider 22kw EV Charger With Attached Cable & Type 2 Plug!